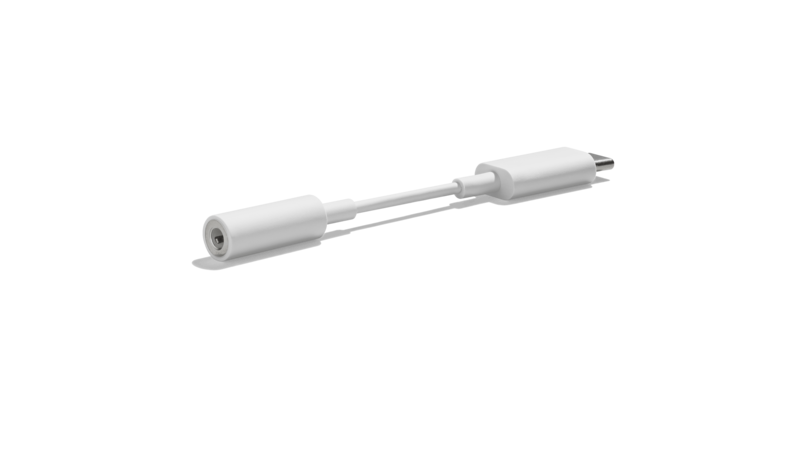 After dropping the headphone jack from the Pixel 2 and Pixel 2 XL, Google received some backlash for initially trying to grab an extra $20 for a much needed USB-C to 3.5mm dongle. Now, Google has decided that its $9 adapter is ready for retirement and has added a new dongle to its store page. The new listing on the Google Store claims that the updated dongle can provide as much as 38 percent longer playback time compared to the previous version. Since there is an integrated digital-to-analog converter hidden in the little cable, most of the gains are likely attributed to changes made to that section. When connecting the new dongle to a Pixel 2 or Pixel 2 XL, the accessory is now recognized faster with 53 percent less latency upon insertion. In practice, going from a few milliseconds to even less is still going to seem reasonably quick. Finally, the new adapter shaves off a little material in every dimension, although so little that it may be completely imperceptible without a side-by-side comparison. The new dongle is 2.8-mm shorter, 0.7-mm thinner, and 0.6-mm narrower. These reductions result in an astounding weight savings of... 0.4 grams. For those still running around with wired headphones regularly, the improved battery life could be a much welcomed change. Arriving at $12, it is a little unsettling to see Google going the route of Apple and charging more for accessories, but the extra battery life might make up for the extra $3 compared to the previous version. Dongles are not a necessary evil. They're annoying and make products more expensive while lowering the user experience. Burty117, orondf, senketsu and 6 others like this. I have had no problem with my dongle. I put it on the end of my AUX cord and forgot about it. For headphones? Bought some high quality Bluetooth ones and have not looked back. Burty117, orondf, senketsu and 2 others like this. TL;DR you paid almost 2x the price for bt headphones to get similar sound quality to wired ones, you have multiple things to charge now and if you have a dongle in your phone you can't charge it. Burty117, orondf, senketsu and 4 others like this. You know one thing they don't have to deal with? The wire when actually using the ear/head-phones. I'll take wire over mediocre sound quality and momentary disconnections any day thank you. Sikirash, Burty117, orondf and 3 others like this. Is it worth such a huge premium and forcing you to buy dongles? No. You are essentially saying that instead of 2 ports you can use you want to be limited to just 1 because you can buy wireless headphones. At most I would pay 25-30% more for the same headphones, but with a battery inside them and it should have the option to use a wire too for when the battery is low (some wireless headphones have this feature). You can buy better branded products to avoid both problems. Even £/$# Chinese products these can maintain a reliable connection. You can't really go wrong with Bose either. More ports the better, the minimum number should be 2 just in case you forget your dongle or your wireless is out of battery. All this over a 3.5mm port that's been ubiquitous for years? It is ubiquitous just like the pockets in my pants. I like to compare it to removing the left side pocket of your jeans and only be allowed to use the right one plus a bag that attaches to it on the outside. Burty117, orondf, yRaz and 4 others like this. Similar? I bought atpX HD earbuds, because I like sound quality (cheap wired headphones sound like garbage). atpX HD offers sound quality better than CDs and way better than wired headphones FYI. Multiple things to charge? I have one more thing to charge, my headphones, which I charge once every three days. The downside of not being able to charge my phone while using a dongle doesn't matter, because id be using my headphones. You don't really understand what aptX HD is and how it works. First off the number of phones that support the codec is very small (Samsung or Apple don't support it) and second it's still just a slightly beefed up version of aptX. All BT audio codecs also add latency and in this case it should be around 100ms and you can't really use the codec with DACs. On a side-note: I'm not denying that the headphones you have sound amazing. They should once you pair it with an aptX HD capable device, but that's not really the point I was trying to make. yRaz and Reehahs like this. Paid $15 for my BT headphones. And your point is? Please expand your idea so that it is clear to all of us. If you were just trying to say that cheap wireless headphones exist then I can only answer with: "Duh!" It's all about choice. If I prefer corded earphones I should be able to use them. If the phone makers are so obsessed with thin devices, I guess they could define a standard to output analog audio through the single USB-C connector. It should be easy with today's electronics to have the connector switch from USB mode to analog mode when it senses the earphone resistive load.